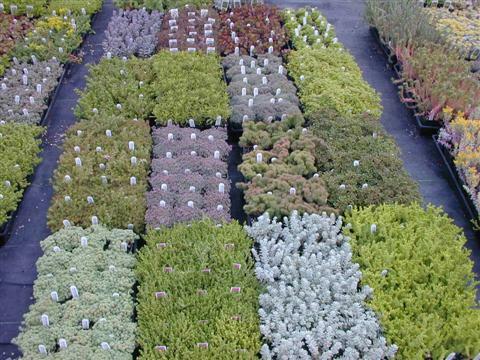 I have acquired Sedum varieties from many sources over the years. 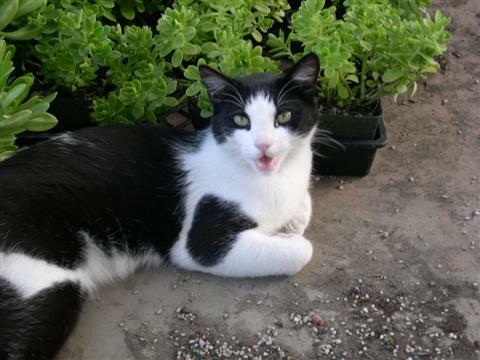 My parents' rockery, local stores and garden centers and yards of neighbors, to name a few. 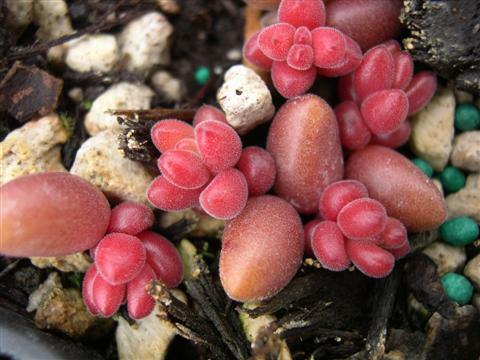 I've also ordered Sedums through specialty mail order nurseries in Oregon and California. 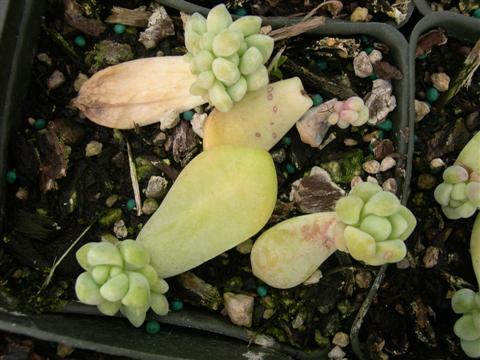 My biggest source of new varieties has been the Sedum Society cuttings exchange and subsequent swapping with individual members beyond the exchange. 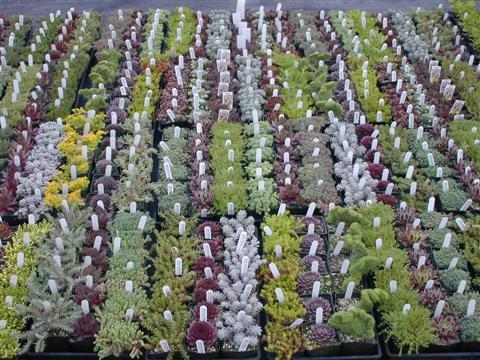 When I joined the Sedum Society, I had around 90 varieties. I now have over 300 varieties, with about 250 varieties currently for sale.
. 24 years later, I still see these 2 varieties from Mom's rockery for sale by various nurseries under these false names. Oh what a tangled web we weave! Thanks to sleuthing by Ray Stephenson, most of the misnamed Sedum varieties that I'd gathered over the years have been correctly identified and named. Close-up photos taken with a digital camera with a macro lens were sent via email to Ray. When a photo wasn't definitive, I'd send a piece of the Sedum in question via snail mail. 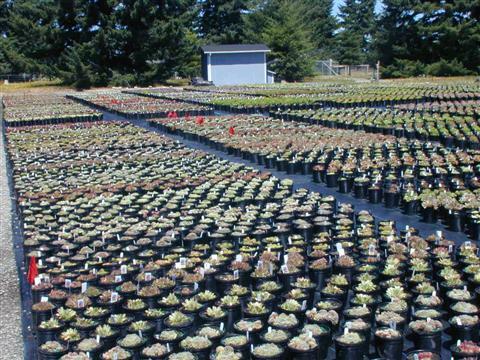 and 5,000 Sedums in 6" (15 cm) pots. 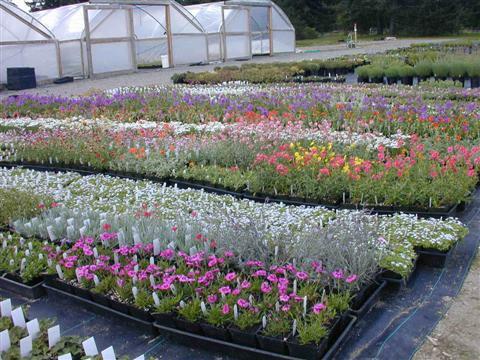 We also grew 170,000 other 3.5" (9 cm) perennials including Sempervivums, Delospermums, Thymus, Saxafragas, Helianthemums, Campanulas and many other genus of low growing perennials. My favorites are the Sedums and Sempervivums. 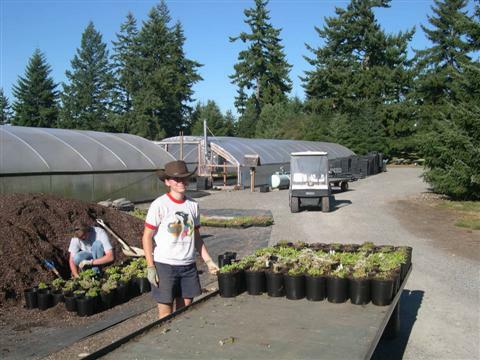 Starting around the 1st of July, most of the selling for the season is done and 6" (15 cm) potting begins. For the next four weeks a crew of workers plants up 3.5" (9 cm) plants into 6" (15 cm) pots. At this time a minimum of 25 of every variety of Sedum are planted into 6" (15 cm) pots, fertilized and kept watered to be grown on for stock plants. Stock plants are the mother plants that provide us with the cuttings needed for next seasons' crop of 3.5" (9 cm) plants. By August, the 6" (15 cm) plants are large enough to provide us with the cuttings that we need. We find that this technique of managing stock plants works better than having stock plants planted in the ground. 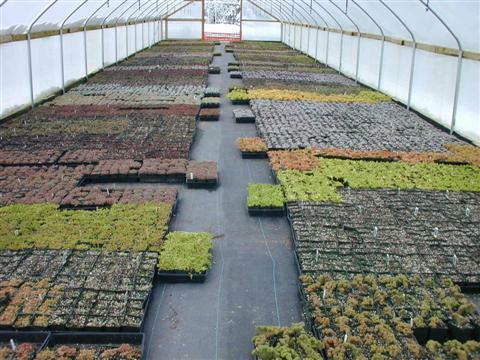 With about 1,000 varieties of perennials we would need a pretty massive planting area. By growing our stock plants in pots, the cuttings are cleaner, have less weed seed, don't have a chance to grow together (mixing up varieties). We can also bring the 6" (15 cm) pots of Sedums right up on to the table where we are taking and planting cuttings. Most of the plants that we use for cuttings survive the haircut and make nice strong 6" (15 cm) plants to sell in the spring. The following July we repeat the process and make new stock plants. The soil that we use is made from locally available materials. It is made from _ fine ground Douglas Fir Bark, _ 'popcorn' pumice and _ screened sandy soil/mushroom compost mixed. We fill the 3.5" (9 cm) pots with soil and use sprinklers to water them in very thoroughly in preparation for cuttings. A single hole is dibbled into each pot of wet soil using pointed sticks. Almost all of the cuttings are done using the 'direct stick' method. This simply means that the cuttings are stuck directly into the pots that they will be sold in. 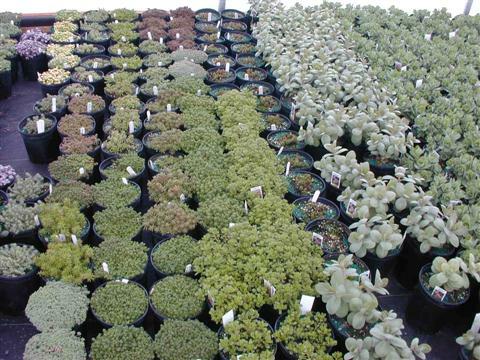 With fine textured types of Sedum such as S. anglicum, S. hispanicum, S. acre and S. sexangulare we use the 'rip and stick' method of propagation. With the thumb and forefinger, a small cluster of stems and leaves are pulled from the plant and placed with the lower end into a pre-dibbled soil hole. 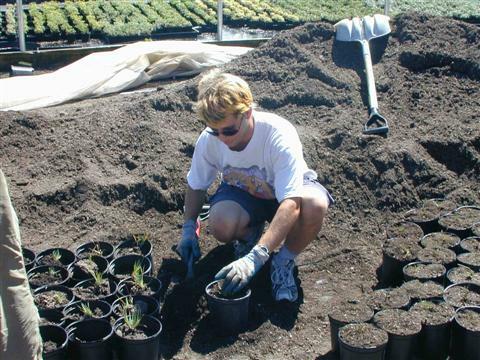 The soil is closed around the base of the cuttings using the thumb and first two fingers of the other hand. Varieties that have longer more visible stems such as S. spurium (Phedimus), S. anacampseros, S. kamtschaticum and S. sarmentosum are cut, one stem at a time in 2"-3" (5 - 7.5 cm) lengths. One or two stems are put into each pot with the top 1" (2.5 cm) of stem left exposed. We don't remove leaves unless they are quite large as in many of the Mexican species and the telephium group. Leaving the lower leaves on actually helps to firmly anchor the cutting in and for us has shown little or no detriment to the survival of the cutting. Large upright Sedums such as S. telephium 'Autumn Joy', S. matrona and S. verticillatum get a slightly different treatment. Between 2 and 4 leaves are left on the upper portion of the cutting, clipping off leaves from the bottom 2" or 3" (5 - 7.5 cm) of the cutting to expose the stem. Since the leaves left on the cuttings are so large, we cut them in half crossways, before pushing the cutting into the soil. This way there is less surface area for moisture loss through evaporation and big leaves from one pot aren't lying across the pot next to it. Many of the Mexican species with very succulent leaves, such as S. treleasii, S. lucidum, S. rubrotinctum, S. stahlii and S. hernandezii, are done in a similar way except we pull off the lower leaves of most of these Mexican varieties with thumb and forefinger. These leaves can be sprinkled onto the surface of flats or pots that have been filled with soil. Many of the leaves will grow new plants, given enough time. After the cuttings are put into the little 3.5" (9 cm) pots of soil, the flats are put into unheated greenhouses (except the tender Mexican varieties which are placed in the heated house) and thoroughly watered in. This watering process smoothes out the soil and removes air pockets from around the base and sides of the cutting. On sunny days we will mist the cuttings to prevent the soil surface from drying out with our overhead watering system during the first week or two. After that we let the soil surface dry before watering. Rooting takes place rapidly and we can see roots on many of the plants within the first 2 weeks. I should mention that the sides are removed from our greenhouses at this time of the year and the large doors are kept open for good air flow. When the sun is shining, it can still be substantially warmer inside than out. Once cool fall weather starts, we cut back on water and only water when the soil looks very dry on the surface. In the tender Sedum house, we keep the heater set at a cool 40° F. The doors are only opened when the temperature is above 40° F. Throughout the winter we keep the doors to all of the other greenhouses open during the days unless it is freezing or very windy. The tops of some of the herbaceous varieties die back in the winter months and are pruned during the winter before new growth appears. In February we top dress all of our Sedums with a 4 month time release 14-14-14 fertilizer using a broadcast spreader. We use a shop vacuum cleaner to pick up extra fertilizer from the floors so it can be used elsewhere. 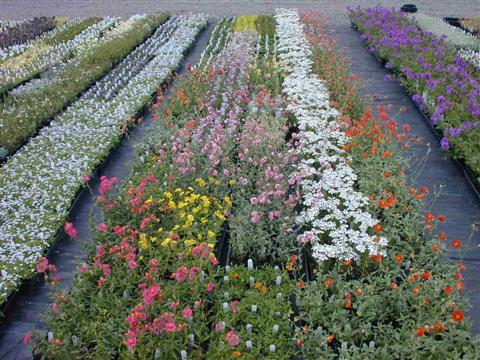 By the middle of March, several varieties are ready to sell with more varieties becoming ready each week after. 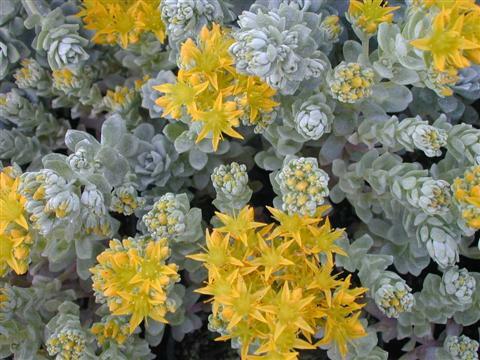 When possible, we space out Sedum plants before foliage starts to overlap. This allows for airflow and almost totally removes the need for pruning. The sun is natures' natural pruning system. When we sell 3.5" (9 cm) and 6" (15 cm) sized plants in the spring, we try to pick out the biggest plants so that the ones left behind are given the optimum space. Some of our growing techniques are rather unconventional. I think we do a pretty good job of growing, but most of the steps we take are on a large scale, without taking the special needs of an individual variety into account. For instance, if a variety prefers a more alkaline soil or more water than the rest, too bad. This is where the individual collector can do a much better job.